Today I participated on an All Access trip to Spectacle Island. We had up to 310 kids, and it was very hectic but at the same time extremely fun. The kids were very engaging. The biggest surprise to them was the new gigantic boat we had : The Provincetown II. It is amazingly big. The boat is able to carry at least 1000 passengers. When we got to the Island everyone ate lunch and started to explore. My responsibility was to fly kites. We got to the top of the spectacle and started to fly kites with groups, but there was this one kid Brandon who wasn't really having a good day. I flew a kite with him and let him take it over. 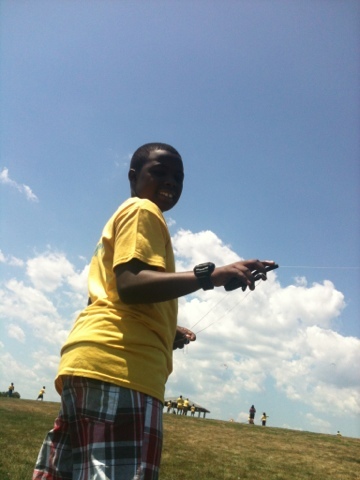 At the end of the day Brandon had the highest kite in the air and said "He had an awesome kite flying day"